Had these 17 years now. love them. Bought some Dr Dre Beats Studio recently cos they had rave reviews. triumph of marketing. Useless for carrying except around your neck and sound nowhere near as good as my HD565's. TOO COMFORTABLE! you may forget your wearing them!! I picked these up fairly cheap (£60) so they were good value. they are kind of my first more 'serious' headphones. comparing them to my HD 202 i can really see the phenominal difference in quality. true my equipment is ancient! (1980s B & O) but i would highly recommend them to someone whos apprehensive about paying £hundreds for a set. Great price(paid under $150),lightweight,can be used for hours on end with no "red ears" effect. Clowns like JL who need brain surgery and a bit of common sense.JL get more woofers in your subcompact car and add 5000W amps,you'll feel better in no time. Great inexpensive open air headphones,headphone amp needed if you want to enjoy these at their fullest.Good rendition of fine detail,midrange quite clean and open(not up to HD580/600)but still in the very good departament.Bass performance is very satisfactory after break in,and if headphone amp is used bass performance is great.These can be enjoyed by audiophiles and music lovers,not for boosted bass freaks or yuppies. Amazing! but 2 major weakneses 1. THEY DONT MAKE THEM ANY MORE! 2. The 3 metre cable is shog dite. I have to get a new one when it was pulled, they dont take much rough and tumble. These headphones have good mids and highs- that is if you own little tiny audiophile bookshelf speakers with 80Hz bass and no subwoofer. I plugged in a pair and put on a digital bass CD to test them to 20Hz. Well they said something like 10Hz on the box with a .2w RMS capability. The jack was only about 50mw. I cranked it to 18/50 and I heard a rattle. I cranked it up into the 20s and thy totally fried. I plugged in a pair of beater sonys with only 45 ohm impedance(.25mwRMS) and I got it to 33-38. At that point the jack clipped. Ever since this moment I have despised Sennheiser. The bass at the point they popped was only like 95db. My 12" JLw6 hits 120db on the same CD out of my car. They get a 1 for bass simular to my old paper factory 5.25s. Bass is weak and the impedence is quite high. I didn't care for these headphones much. Perhaps it is a matter of preference (some people don't care for heavy bass), but these headphones did not provide me with the full, rich, deep sound that I had wanted. The bass was too weak and the impedance was way too high. The high impedance made it hard to drive them to any decent level of volume. 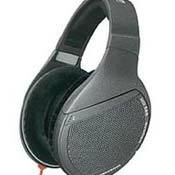 I much rather prefer the Denon AH-D 950s. All in all I think they are quality headphones, but they just weren't to my preference. Awesome Detail. Superb MIDRANGE, TREBLE AND BASS. How can you define rightness ? Can be "over-detailed" at times, (if that really is a weakness), crappy recordings will sound even crappier. Great records will sound even greater. First of all, what the f¤#k are you talking about JL ? These headphones will reward you with endless hours of awesome musical reproduction. They RULE, plain and simply. supermarket electronics. They deserve it. And did i forgot to mention that they´re comfy as hell? After 1 minute of listening you won´t even belive they´re actually on your head. You just looze yourself in the Music. You can't accurately measure bass output through any headphones! And yes, ANY test CD with only bass tracks will definitely fry out ANY pair of headphones! Sennheiser's HD565's are a quality pair of headphones that should be handled only by TRUE audiophiles! I wish it wasn't priced so high, however. JLaudio, go back to your crappy consumerized Sonys, and let the rest of us rest in open-aire bliss. sound absolutely brilliant, but if you listen to dance music you may find they lack dynamics and perhaps a bit of bass. I demoed these at Tweeter (United Audio Centers) through a headphone amp connected to a Panasonic portable CD player (SL-SX469); these sounded louder than the other Sennheisers demoed at the same store (but not as loud as the Sonys). But the sound is a bit murky and laid back compared to my Sony MDR-V900's--but they sounded better than either my MDR-V300's and MDR-V600's. The bass and mids are clear, but the highs aren't as detailed as they should given the HD565's open-aire design. Please audition them before you buy--you may find out that you like the non-fatiguing, laid-back sound. I currently own three Sonys (MDR-V300, MDR-V600, MDR-V900). I also demoed three Sennheisers (HD470, HD490, and HD570) and one Sony (MDR-V700DJ) at the same store.